When the Gene Polisseni Center opens in September, hockey fans will feel the game-night difference sitting in a $38 million, 112,000-square foot, state-of-the-art arena. 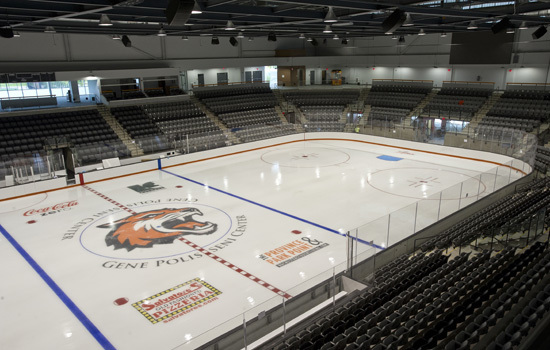 When the Gene Polisseni Center officially opens in September, hockey fans will quickly feel the game-night difference sitting in a $38 million, 112,000-square foot, state-of-the-art arena—a welcome change from historic Frank Ritter Arena, the Tigers’ home for the last 46 years. In recent years, popularity of both the men’s and women’s hockey teams has skyrocketed resulting from the men’s team’s historic run to the 2010 Frozen Four and the women’s team winning the 2012 NCAA Division III Championship. As fandom rose, RIT quickly outgrew Ritter Arena. A lack of amenities at Ritter Arena, paired with limited seating (two restrooms and one main concession stand) made hockey night a test of patience and endurance. Spectators would cram into the building often standing three-deep behind the railing, and due to the lack of reserved seating would often arrive two hours before game time to claim seats. The new Gene Polisseni Center boasts 4,000 seats, and with standing room, has a total capacity of 4,300 complete with a student/pep band/Corner Crew section. Other seating options include reserved chair-back seating and a special club section with buffet meals and cash bar. Six corporate suites are available—four on the club level, one on the media level, and a unique bunker suite at ice level. To assist in this effort, the box office will offer mini-pack ticket options, family night, ticket promotions and discounted group rates. James Watters, RIT’s senior vice president of finance and administration, began his extensive research into the vision for the Polisseni Center in 2011, including working with others to settle on a central location close to the Gordon Field House and Activities Center, Ritter Arena and dining services, making outdoor tailgating and related events possible. 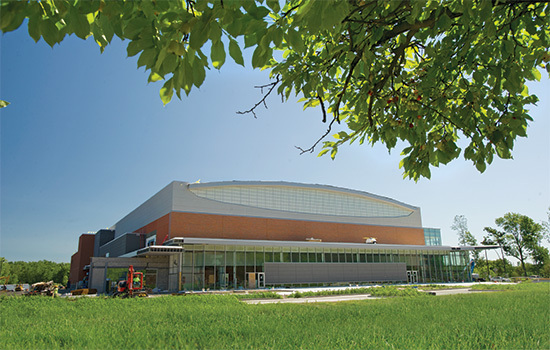 Soon after initial donations to the arena were made, including a $1 million gift from alumni Stephen and Vicki Schultz and a $4.5 million donation from the Polisseni Foundation (with backing from RIT trustee B. Thomas Golisano), several other rinks were visited as potential models gauging the best fit for the RIT campus. The Gene Polisseni Center will be among the few new arenas without a center-ice scoreboard. Instead, two 23 foot by 13 foot high-definition video boards—a gift from RIT alumnus J.M. Allain ‘03— will be located on each end of the ice, complete with full captioning. “With the pitch of the arena the way it is, having the video boards on opposite sides of the rink gives every seat in the building an unobstructed view,” said Watters. “In addition, it gives us great flexibility to host external events, such as concerts or graduations. For more information, including grand-opening details and corporate sponsorship opportunities, go to www.rit.edu/arenas. For single-game and season ticket information, go to www.rittickets.com or call the Gordon Field House Box Office at (585) 475-4121. Watch a video featuring a behind-the-scenes look at the arena at http://bit.ly/RITPolisseni. According to representatives from RIT’s Parking and Transportation office, the flow of traffic once the center opens will not be affected. When U Lot opens in September, it will have about 250 spaces, with other parking spaces in locations that are less than a quarter-mile away. For after-hours events, visitors will be encouraged to park in D, S and R lots, which can accommodate roughly 1,300 vehicles.